I have a bunch of maps hanging on my home office wall. As I was aimlessly staring at them one night, something caught a few of my four eyes. For some reason, I thought it might be interesting to point out what I saw..
Joshua Tree NP is the only National Park (NP) that I can think of that is tightly encircled by a road network that allows the park to be completely driven around. Most NPs have either a drive that enters the park at one end and exits at another (e.g., Yellowstone, Grand Teton, Rocky Mountain, Yosemite (non-Yosemite Valley) or a drive that dead ends in the park and requires you to back-track out (e.g. Bryce Canyon, Arches, Grand Canyon, Denali, Yosemite (Yosemite Valley)). The trip around Joshua Tree NP is on a combination of CA62, CA177, and I-10. I will call this combination of roads "The Joshua Tree NP Beltway. This beltway is about 196 miles long. So what? You are asking...if you are still here. Yes, three Washington DCs could be fit within the JTNP beltway. I know there is no reason we would want 3 Washington DCs, but ... hopefully, you get my point. If you prefer, the entire state of Rhode Island could be fit within the beltway. 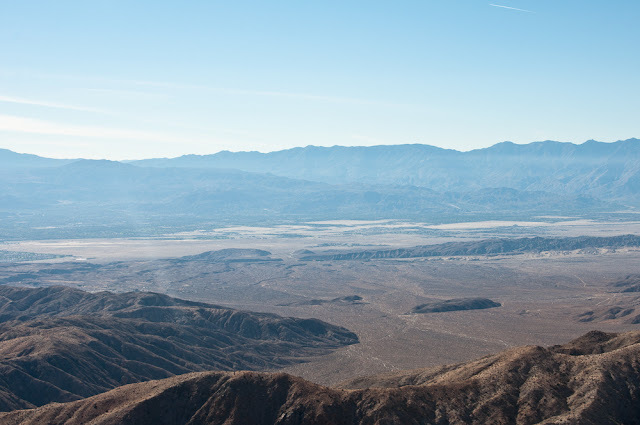 The Joshua Tree NP Beltway is also probably the only beltway that has an evelation change of more than 2800 feet between the high-desert Yucca-Twntynine Palms portions (elev 2800 ft) and the low-desert Coachella Valley I-10 portions (sea level to slightly below sea level). This elevatiion change is shown in the following picture. The picture was taken up at Keys View in JT and looking down at the Coachella Valley and I-10. Do You Zzyzx?? Do You Want to Zzyzx?